After 6 long years, we finally meet again! 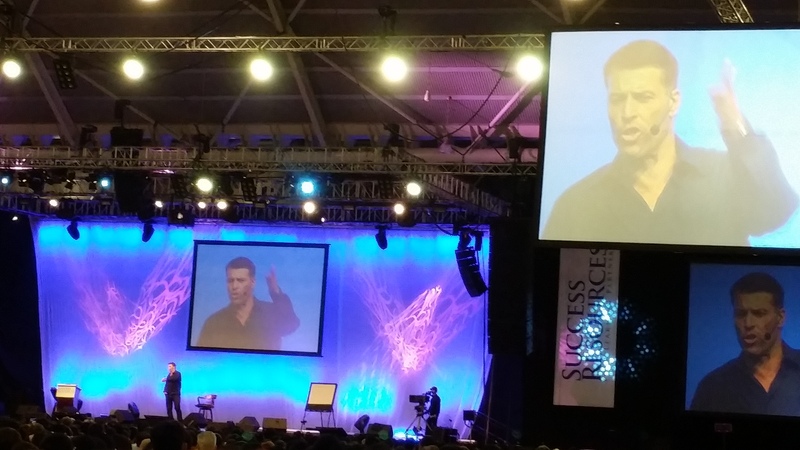 Last week I attended a 3-day Tony Robbins Seminar at Expo. There was no Firewalk this time around, but the lessons learnt were definitely worth many times the price of my ticket to the event. You can absolutely count on the big guy to deliver. I always make it a point to write down 1-3 things I’ve learnt at the end of every seminar I attend, and to try implementing these things into my life and business over time. Lesson 1: Take Massive Action. Taking massive action is the key to success in most areas of our lives. If you KNOW something and you don’t do anything, then you know NOTHING. You are simply AWARE of that something. Many of us are guilty of this. Pity the guy who spends 6 months trying to study the best physical training program, 6 weeks trying to find the best trainer, another 3 weeks interviewing these trainers, 1 week looking for the best pair of shoes and a weekend trying to get an outfit that matches that pair of shoes! Sometimes, we just need to get out of the house and START running! As a financial planner, I always spend a good amount of time with my clients discussing about goal setting. People don’t plan to fail, yet many people fail. Why? The reason is this: Many people don’t know what they really want. They don’t set their goals systematically. Some don’t even write them down. Others set goals but don’t commit to achieving these goals. They are as fickle as the winds, changing their minds easily. After deciding what you want and committing to achieving them, you need to resolve to do all in your power when the going gets tough. Too many people quit on themselves the first hot day. Sure there may come a point when you might need to be truthful to yourself and quit. But at least resolve to stay through the season. Resolve to stay till the end of the game. Imagine watching a football match. After going a goal or two down, players from the losing team start walking off the field before the final whistle is blown. How would that make you as a spectator feel? Once upon a time, there was a terrible drought in a faraway land called Bukit Timah. There were 2 farmers who lived in Bukit Timah, and they were struggling with their work. One farmer decided that since there was no rain, there was no point slogging and hurting his back from preparing his fields. He figured it was better going home to watch reruns of How I Met Your Mother. The other farmer, although tired and hungry, believed that there are things he can control and things that he can’t control. He wasn’t going to let things that he couldn’t control pull his attitude down. So he continued to prepare his fields, shine (no rain) or shine. When the rain finally arrived, guess which farmer reaped the fruit of his labor? Success is about probability, there is no guarantee. It is always about taking the right actions that can increase your probability. The earlier you accept this, the earlier you can focus on the right things that will take you where you want to go.